Be a part of Vaughan's up and coming new downtown. Cosmos Condominium is one of the first phase in a brand new, four hundred and forty two acre master-planned community, set to transform the Vaughan local community. A brilliant master-planned community with a spectacular park at its centre, futuristic architecture, ultra-modern suites and state-of-the-art amenities. A community just steps to the Vaughan Metropolitan Centre Subway Station. Located at the southwest corner of Highway 7 and Maplecrete Road. The City of Vaughan currently is home to more than 11,000 business enterprises providing direct employment to almost 200,000 people. Vaughan was the fastest growing municipality in Canada between 1996 and 2006. With the long awaited and needed Mackenzie Vaughan Hospital that will be completed in 2019, Vaughan is expected to rise it's population and employment significantly. This is your opportunity to be a part of Vaughan Metropolitan Centre. Cosmos Condominium is just steps away to the new VMC Subway Station, you will be so connected to it all. This is the spot you've been waiting for. Vaughan's Up and Coming Brilliant Neighbourhood. Magnificently Master Planned. Perfectly Designed. Now you can live at the Cosmos Inspiring condos, the VMC Subway 407 and 400. These are opportunities that only happen once in a lifetime, with a privileged few who are able to discover and value them. Classic architectural design, built with the finest materials and finished off with luxurious features all come together to offer you incredible prices, exceptional value & outstanding location. 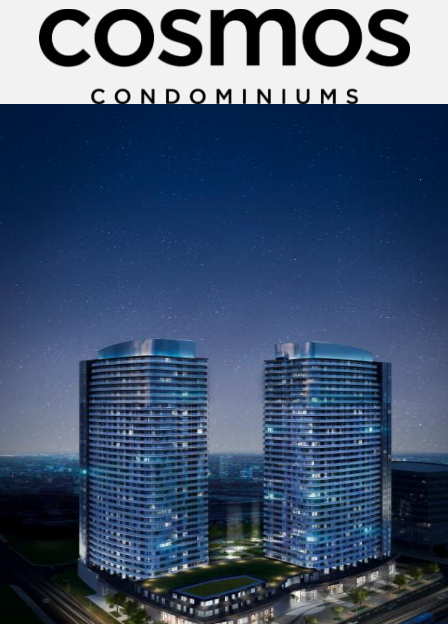 Cosmos Condominiums is the perfect spot to live or rent and invest. Situated steps to the subway line, just off of highway 407, this central location is a huge advantage regardless if you are going to live, rent out or invest to re-sell. 9 minutes on the subway to York University and 45 minutes downtown Toronto. Phase one onsisting of a proposed 35 storey residential tower, 12 storey office building and four storey podium that will house ground floor commercial. Phase two will consist of two 25 storey residential towers and a five storey podium. Phase three is expected to consist of a 10 storey residential and retail podium with a 35 storey residential tower. The mixed-use proposal will have 1,328 residential suites with a total of 100,663 square metres of residential space, 3,300 square metres of retail use space and 20,207 square metres of office use space. "2014's & 2015's most successful condominium sales were all on the subway line"
In order for an investor to take the most advantage of Buying Pre-construction Condos is to buy before its open to the public. Prior to opening day of a new condo sales office to the general public, prices may have gone up by $10,000 to $20,000. By registering here today, you will have an opportunity to invest in a unit at the lowest price possible before its open to the public. This gives you Guaranteed First Access to inventory, best pick at unit levels, floor plans, lowest prices guaranteed and Pre-VIP Access Incentives & Promotions. This Pre-VIP Event will be one day only.